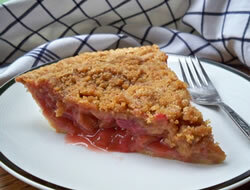 Rhubarb combined with strawberries for a springtime delight. Topped with a brown sugar streusel, this rhubarb and strawberry pie is a perfect way to enjoy two spring fruits in one dessert. Place the pie crust into the pie plate. Trim and flute the edges; set aside. Dice the rhubarb and place in a large bowl. Add the sliced strawberries. Add the sugar, flour, and lemon juice; stir all together until evely mixed. 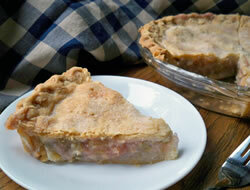 Carefully pour rhubarb mixture into the pie crust. Mix together the flour, brown sugar, and cinnamon in a medium bowl. Cut the butter into the dry ingredients until crumbly. 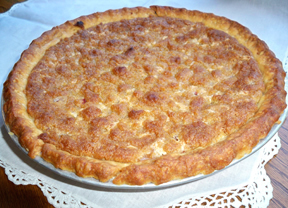 Place in the preheated oven and bake for 50 minutes or until filling is bubbly and the crust and topping are browned. "I had this at a friend's house this last weekend. I loved it, especially the streusel topping. 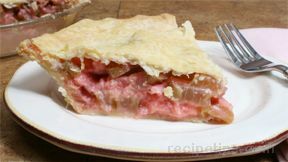 She e-mailed me the link to this recipe and I hope to get enough rhubarb to make it this weekend."